Many people in our reading audience have visited and/or worked at the National 4-H Center (now the National 4-H Youth Conference Center); to all of them it is definitely more than a group of buildings. We asked one of those visitors/workers to tell us what it meant to him. 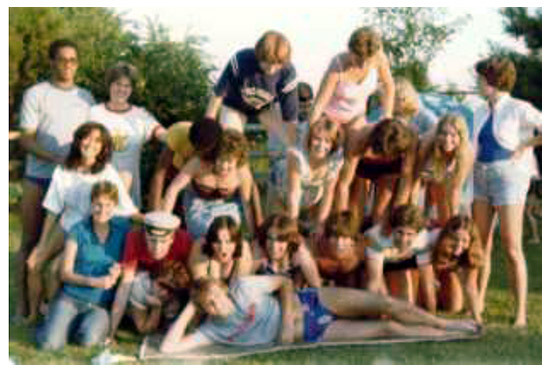 1979 4-H Program Assistants at Citizenship Washington Focus make a human pyramid as part of their team building exercise. It’s just 12.5 acres on Connecticut Avenue in Chevy Chase, Maryland, one mile north of the District of Columbia line and only seven miles north of the White House. It was originally built as an Inn in 1893, turned into a girls’ finishing school and, in the early 1950s when 4-H was looking for a national home, it became the location of that home. Purchased with money borrowed from a life insurance policy and paid off with the help of the nickels and dimes sent by 4-H’ers from across the country, those 12.5 acres became the national home of 4-H, the National 4-H Center. Opened in 1959 by President Eisenhower, almost everyone who visits the place senses how special and important it is. I felt it the first time I visited. It’s now an oft-told-tale how, as a Citizenship Short Course delegate in 1973, I sat on the front steps of old Smith Hall and thought “I’m going to work here someday.” Even I could not have guessed that I’d actually return three times to do so. I first returned in 1979 to serve as one of the first Citizenship Washington Focus (CWF) Program Assistants, the year Citizenship Short Course became CWF. By then things had changed. National 4-H Council had been created in 1976 by joining the National 4-H Service Committee with the National 4-H Foundation. Smith Hall had become J. C. Penney Hall, rebuilt with a sizeable gift from J. C. Penney. A new dormitory and conference room complex (Firestone, McCormick, and Kellogg Halls) now comprised the recreated campus; Turner and Warren Halls still stood to the left and right of J.C. Penney Hall as if guards. The Supply Service stayed in Turner Hall. The Program Assistants (PAs) stayed in Warren Hall, named for Gertrude Warren, the first head of Girls Club Work at USDA. Twenty-eight early 20- somethings found ourselves living together for three months in that small building – I wonder what the fire marshal thought! I roomed with Thomas Tell Tyler Thompson from Tennessee in a basement bedroom. A little stream would flow through it whenever it rained – until they fixed the foundation. In January 1980 I left Council to try my hand at 4-B in Botswana but returned again in 1981, welcomed back by Ray Crabbs and Francis Pressly; assigned to the staff of Jean Cogburn and John Allen. Although against policy, I began dating a co-worker named Phyllis Dupuis. We got around policy in 1983 by getting married; one of many such “connections made at the National 4-H Center (perhaps another story? ).” It was during this time that Louise Kilpatrick told me, “If you want to be successful in Extension, you need to leave Council and work in a county. That is where the real work of 4-H occurs.” So, in 1984, I left Council to see if Louise was right. As a 4-H Agent in Massachusetts, then a member of Maine’s 4-H staff, I had many happy occasions to return to the National 4-H Center with delegations to CWF, National 4-H Conference and other programs. However, it wasn’t until 2002 that I was able to return again as an employee – this time to coordinate the development and implementation of 4-H Afterschool under the direction of Dr. Eddie Locklear. Eddie retired and 4-H Afterschool became an essential vehicle for 4-H; my work continued with 4-H Science and grant management. But when the day arrives that I leave for the third time, perhaps I’ll think of how Patti, one of the ‘79 PAs, expressed her feelings as she prepared to return home at the end of that summer, “It’s not like going home, it’s like leaving home. You’ve become family.” Leaving Council can be something like that. I know I’ll hear the words of Dot Emerson. As the ’79 PAs departed she said, “What I have learned from you would be like living in a foreign country. New ideas, new freedoms, nonsense, laughter, and enlightenment.” That is what being at the National 4-H Center is like. The National 4-H Center. It’s just a few buildings located on 12.5 acres in Chevy Chase, Maryland. Yet it is so much more. This entry was posted in 4-H History Preservation Newsletter and tagged 4-H Center, 4-H History by NewsAdmin. Bookmark the permalink.